Let's Get Out Of Here! : A-Z Challenge 2012: F is for Friday the 13th! A-Z Challenge 2012: F is for Friday the 13th! F is for Friday the 13th! Produced by Frank Mancuso, Jr. 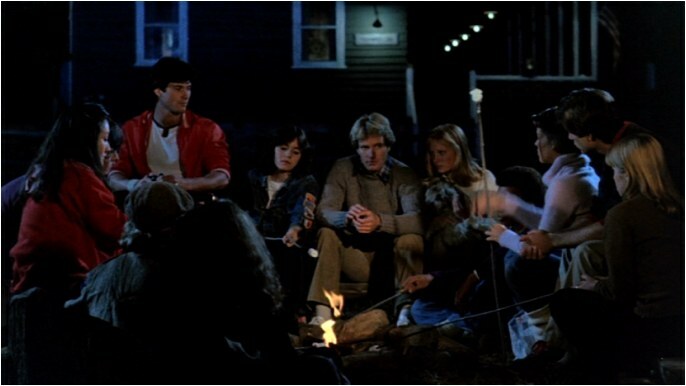 In the summer of 1980, Paramount hit the jackpot by picking up an independently made horror movie called Friday the 13th. The movie made the company a great deal of money, and so a year later no one was too surprised when a sequel appeared. As the movie fades in, it is two months since the events of the first movie, and we are delighted to see Alice (King) again. 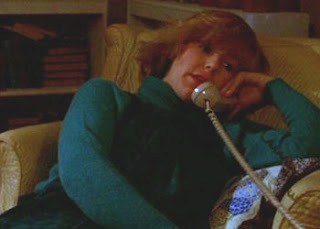 She has either stayed on in the town of Crystal Lake, or returned – trying to exorcize the demons that have plagued her since she beheaded Mrs. Voorhees – the batcrap crazy psycho who offed all of her friends on that stormy Friday, June 13th - through a therapy combining her art, arguing with her mom on the phone, short showers, hot tea, and possibly ice sculpture. I am basing that solely on what we see in the opening minutes of the movie – but before we can learn any more – someone shows up and enters Alice’s temple. No, not that, you dirty bird! And there’s no worship going on either. No, I’m afraid Alice – given the last name Hardy in one of the novelizations – doesn’t live up to that last name, checking out of the second movie in the opening minutes after the intruder gets picky with her. Amy, no, it's not 3-D until the next movie! The director chair for this entry was offered to Sean Cunningham, but he said no as he was trying to work away from the horror genre at that time. So Paramount hired Steve Miner – who had acted as Unit Production Manager on the first movie to take over the reins for this one. Miner does well with his directorial debut, making a worthy sequel to a fine first film. 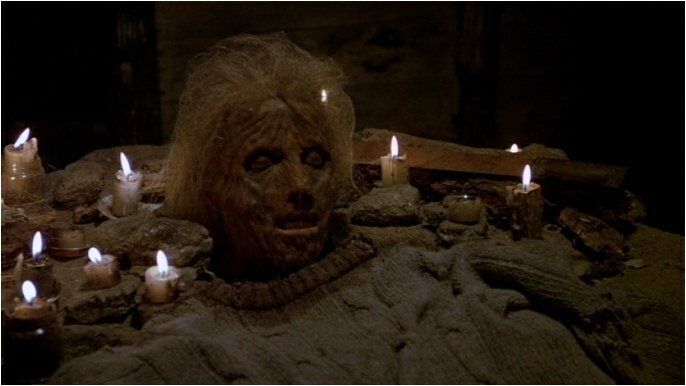 At the time of its production Miner was quoted as saying in Fangoria magazine that Part 2 would be “…more of the same, only better.” I wouldn’t go that far – the first movie has a really rough edged charm that is a little lost in this more slickly made sequel, but in the end it’s a fine entry. There are some story issues, starting with the choice of new killer to take over for the undeniably dead Mrs. Voorhees – while Jason would slaughter his way into the Horror Hall of Fame – there are some questions left by the movie, which just kind of deposits him in the woods and takes off. Jason really PICKS his weapons carefully in this one.. But let's leave the theorizing for the later paragraphs - should anyone (everyone?) want to skip all that and just find out what I think of the movie. Back when I first saw this one I was mad - because the Fangoria preview article showed a lot of effects that the MPAA insisted be cut out. Carl Fullerton stepped in for Tom Savini and did a spiffy job on the makeup effects - and I still hope that somehow a more complete edition will one day be released - we NEED to justify those poor kids' suffering shooting the scene where they're double skewered by spear by actually seeing it - instead of "spear goes up - spear goes down off camera - spear head hits floor with some blood." Summing up, as I'm starting to rival Simon Hawke's novelization of the movie in word count - Amy Steel is an incredibly appealing Final Girl; and Steve Daskawicz (aka Steve Dash) makes a fine Jason before he found that iconic hockey mask, with Warrington Gillette in support for window jumping sans hood. In any case, the script keeps the pace up, the deaths are parsed out at regular intervals, and the slick studio look is nice. It's a must for horror or slasher fans - and a high recommendation for those who take their horror in smaller doses but still like a good stiff shot now and again. Check this one out, kids! 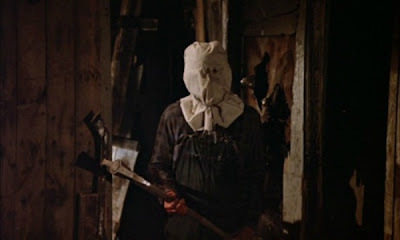 All right - I'm going to wax long and eloquently about Jason Voorhees for a while - not interested? Keep not reading until you see the "Let's Get Out of Here ?" section - you're clear for regular review from there down. There is a scene in the second half of the movie where a tipsy Ginny talks about her theories on Jason to a disbelieving Paul and Ted, but she is more concerned with what he’s become than how he managed to make it happen. As I asked in my series retrospective series – we are supposed to believe Jason climbed out of the lake as a young man in 1957, and was unable to find his mom or something. Eventually, now almost thirty years later – remember, this is 1985 as far as the story goes – Jason has become this feral creature living in the woods, killing his food and taking violent umbrage at anyone trespassing on what he considers the memorial garden for his late momma. 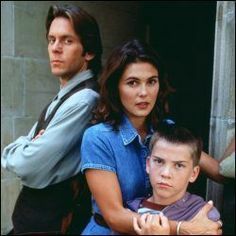 Having spent some time thinking about this since I posted that in October – I actually can explain how we get a fully grown living Jason seeing his mom killed and taking up her murderous mantle thereafter. "Oh crap I'm glad Jason's not here to see this!" Now all that does provide what I think is a reasonable explanation for how we get from Part 1 to Part 2, except for one thing: how Jason figures out Alice is staying in town and where she is. But I've done my part - I'll leave it to others who are fans of the series to pick up this ball and run with it. To finish, then - Jason did not drown in 1957. The attack on Alice's canoe at the end of the first movie is a dream. Jason is alive and grown in this movie, and alive in Parts 3 and 4. He finally buys it when Tommy Jarvis goes medieval on him at the end of 4, and after recuperating through part 5, he returns in zombie form for parts 6-11. That's my theory and I'm stickin' to it. At right around the 18:00 mark, Ted doesn't want to talk about Camp Blood. 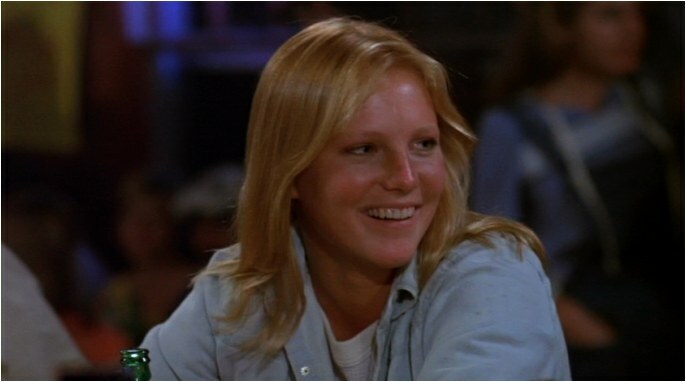 Why yes, that is me and Amy Steel together! The wonderfully cheeky Kirsten Baker! And a shout out to already inducted Adrienne King! Welcome aboard, Amy and Kirsten! Hey Adrienne! despite a distinct lack of hockey mask!" "G" I hope you'll come back for tomorrow's post, and until then, you Can Poke Me With A Fork, Cause I Am Outta Here! I LOVED this piece and the award was very well-deserved, my friend. This is an iconic franchise that I think inspired an entire generation of horror fans, myself included. Thanks MB - and can you believe it - there's MORE from this series coming during this A-Z! Will I ever stop writing about it? 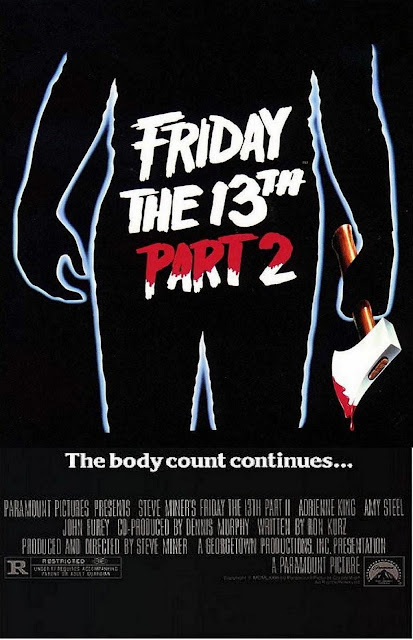 You'd have to be from another planet not to have seen Friday the 13th or one of the sequels. I spoofed this in my movie short "The Bear Switch Project." Great post! Thanks Luana - and you're totally right - I doubt there is a single person whose teen years touched the 80's who didn't watch several of these on home video at least. I think you summed it up perfectly, Mr. K! Well, welcome to our world then! ;) This post must have seemed like it was written on another planet then - a review of a sequel, with a bunch of mythology nattering at the end - you're a brave soul to make it through this one! Thanks, GE! Good theory. Makes sense to me! Thank you so much! Yeah, I was the third boy in the family, with an eight year gap between my next older brother and me - so my parents were too tired to notice what I was watching. Yay! Thanks so much for coming by - and for following! 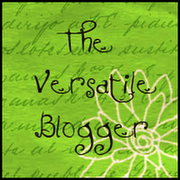 You are one of my 68 favorite people in the Blogosphere! Next to 3, 6 & 7, the best Ft13 movie. An extremely cool and tense Jason-flick. Your theory is very, very interesting and definitely makes sense to me. Absolutely one of the goodies in the series, Harry. Thanks for the kudos on the theorizing - I don't know why I spend so much time working this stuff out in my head - but I can multitask, so at least I'm getting other stuff done at the same time! I'm not a true horror aficionado, but the actresses alone make this entry worth a careful look--I mean, read. When my kids were young, we watched a show called Kim Possible. At least two episodes revolved around strange goings-on at lakeside Camp Wannaweep. It amused me no end that a Disney writer tucked in what was, to me, an obvious Friday the 13th reference. Betting the producers didn't see it, or changes would have been made. They are fetching, aren't they! I too enjoy when there's a good wink wink joke in a kids program referring to something not for kids. A-Z Challenge 2012: Z is for Zero Movie Posters! A-Z Challenge 2012: X is for Xaviera Hollander! A-Z Challenge 2012: U is for Ursula Andress! 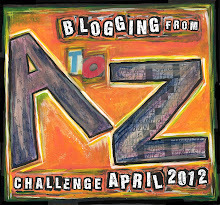 A-Z Challenge 2012: R is for Random Stew! A-Z Challenge 2012: Q is for Quark! 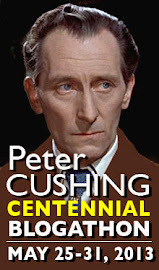 A-Z Challenge 2012: P is for Part 2, Doctor Who! 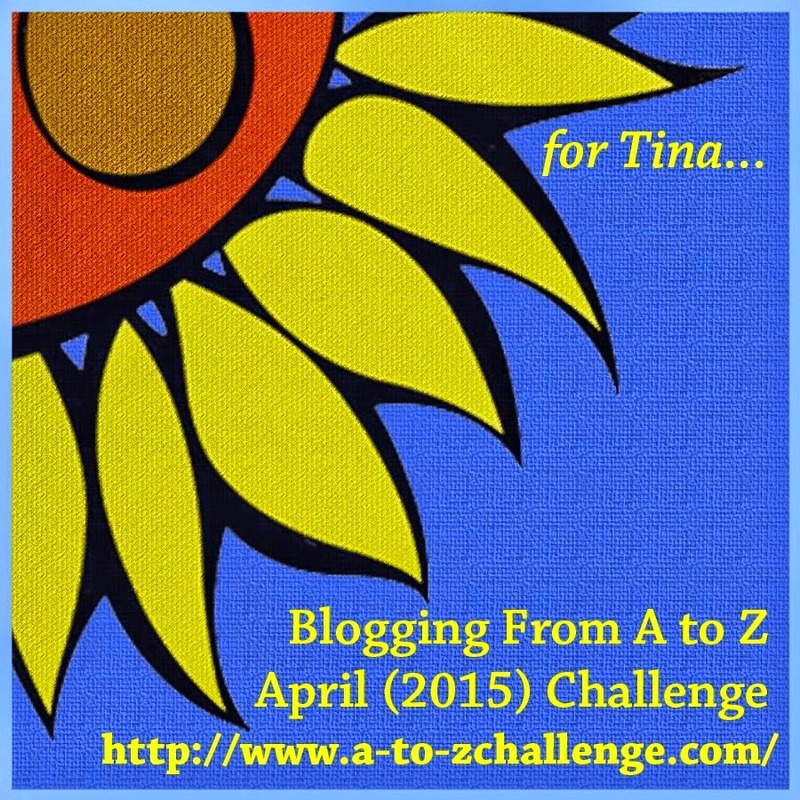 A-Z Challenge 2012: O is for Olivers! A-Z Challenge 2012: N is for Never Movie Posters! Full Moon's 4th and 7X7 Link Award! A-Z Challenge 2012: M is for Maniac Cop! A-Z Challenge 2012: L is for Lucky Ted! A-Z Challenge 2012: K is for Karloff PSAs! 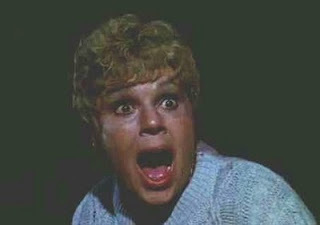 A-Z Challenge 2012: J is for Jaws of Death! 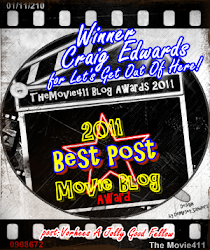 A-Z Challenge 2012: H is for Hard Movie Posters! A-Z Challenge 2012: G is for Get Crazy! A-Z Challenge 2012: D is for Doctor Who! A-Z Challenge 2012: C is for Chuck Norris! 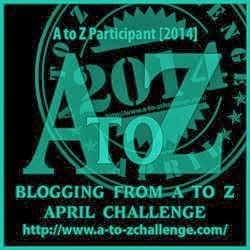 A-Z Challenge 2012: A is for A-Z 2011!